Here is our second tune, play using the “pick strum” guitar pattern taught in Level 008. 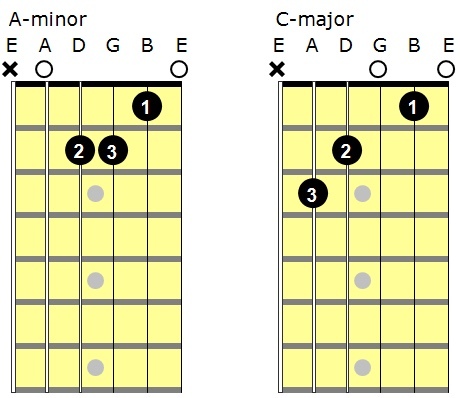 Both the C-Major and A-Minor guitar chords start on the A string. 2) Remember speed is not important now, keeping a steady beat is. Go slow. 3) Set a goal speed of 60 bpm on the metronome for each pick and strum on your guitar. 4) Add this song to your practice routine for guitar chords.